After running for two days and having covered a total distance of 140 kilometers, I was already thinking of quitting from my adventure run and tried to pack up my things. 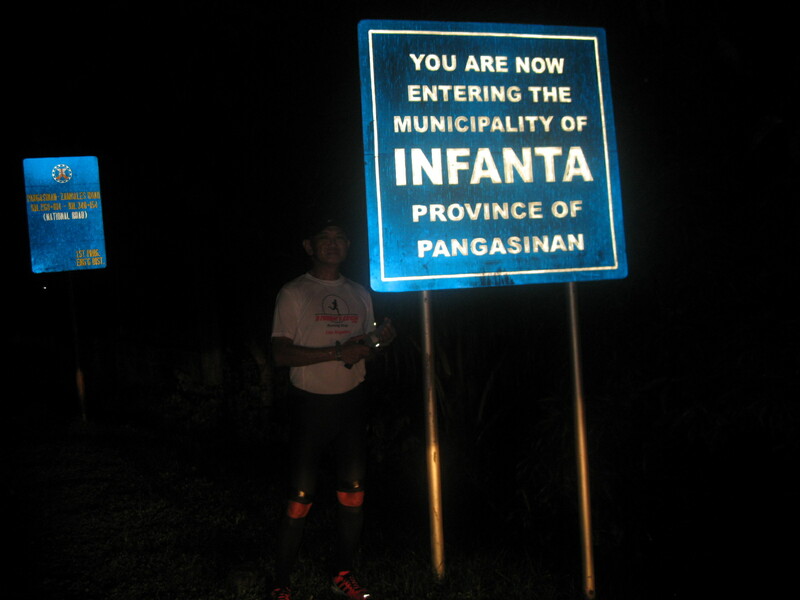 Once I woke up from a cheap hotel in Alaminos, Pangasinan on my third day, I decided to visit the Provincial Governor of Pangasinan in Lingayen, Pangasinan and gave him the Plaque of Appreciattion that I prepared in behalf of his support in the conduct of the PAU Bolinao to Sual 65K Run. After the Plaque of Appreciation was handed to him, I was still thinking if I will continue with my adventure run or not. As I was driving from the Provincial Capitol area, I came to realize that I have to finish the task that I had started. 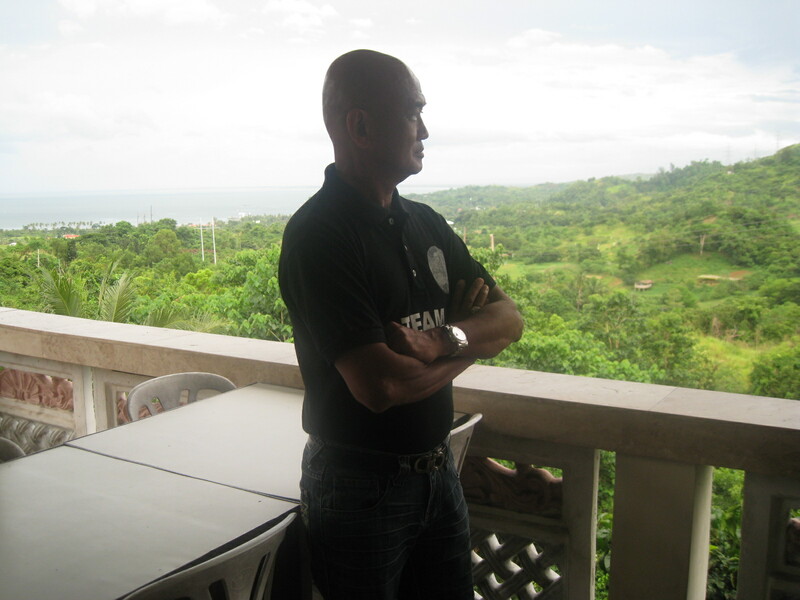 I had a slow ride from Lingayen up to Alaminos, Pangasinan and decided to have my early dinner at the Zigzag View in Sual, Pangasinan. It was in this early dinner that I was able to firmly decide to finish the run and have it done as a “night run” and be able to complete 200 kilometers for 3 days. 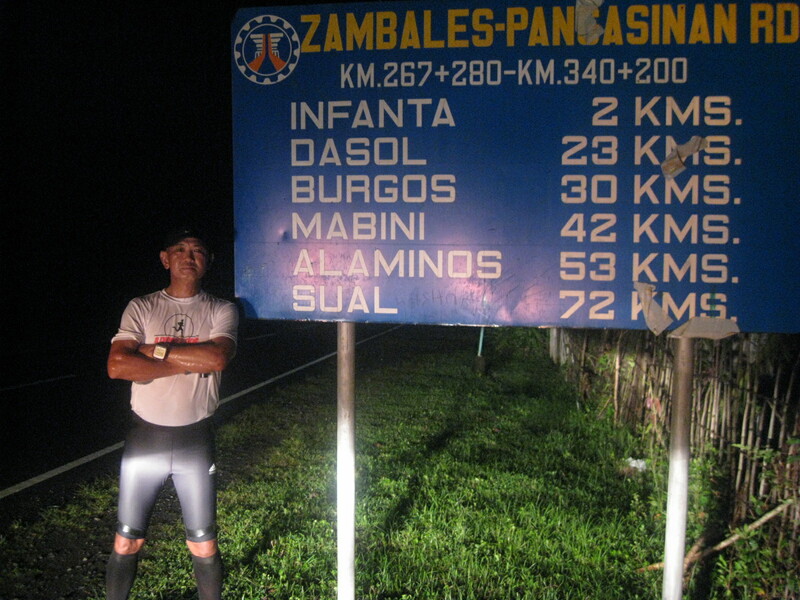 After dinner, I drove to Santa Cruz, Zambales, the last town of Zambales before reaching the boundary of Pangasinan and tried to study the terrain and the points/places where I could have my “pit stops”. I arrived at my designated starting point, Town Plaza of Sta. Cruz, before 7:00 PM and was able to rest for two hours before my “jump-off” time at 9:00 PM. I wore my white ARC Shirt, Adidas Tech Fit Compression Shorts, CWX Compression Calf Sleeves, and Adidas Adizero Shoes and I was ready to go. At exactly 9:00 PM, I started to jog and run leaving the town of Santa Cruz using my headlight and “Surefire” hand-held mini maglight. It was cold and windy as there was a weather disturbance forecast on the said area for the days to come. After a few kilometers, I could see the DPWH road markers stating the road distance from my place to the different destination towns along the way up to the end of the Olongapo-Alaminos Highway. I had to stop to have my pictures taken on these markers. 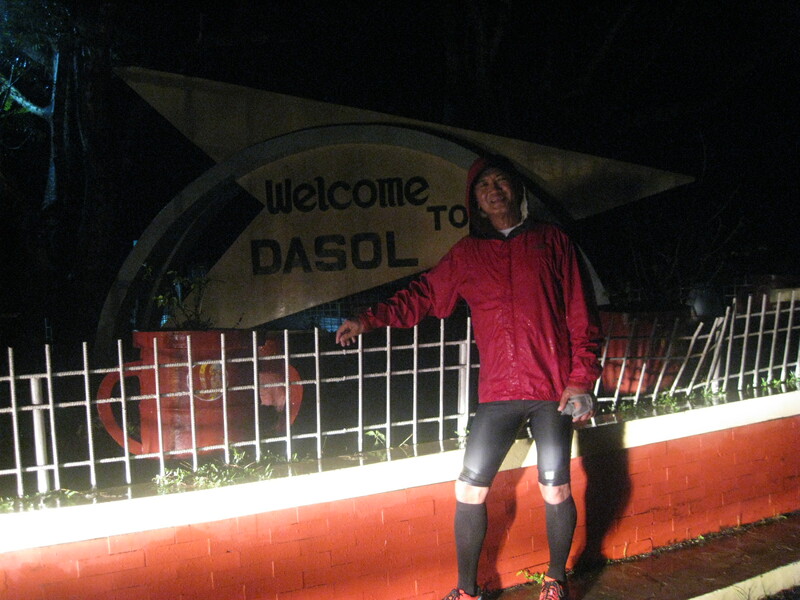 As I continued my run, it started to rain upon reaching the territorial area of the Province of Pangasinan. I had to use my TNF windbreaker to prevent my body from getting cold. There was not much vehicular traffic on the said highway and I was alone on mosts parts of the area. My support vehicle had to tail me in order to provide additional illumination on the road from the headlights of the car. On this run, my support crew was already an expert in providing me the replenishment for my hydration and nutritional needs that I had to minimize stopping in waiting sheds. I had to take a lot of solid foods like boiled eggs, fruits, peanut butter sandwich, and sometimes energy bars. When there is an inclined road, I had to brisk walk and run again once I reach the peak of the road. 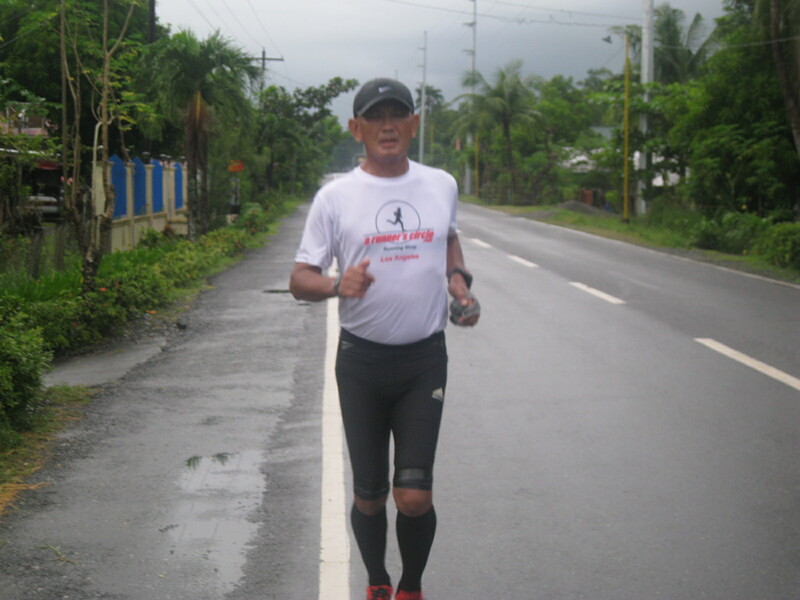 As I ran more on the rolling terrain of Pangasinan, the rain and winds keep on battering me while I tried my best to maintain my running pace. It was really fun running in this kind of weather. I felt I was sweating inside my shirt and my body was warm while the cold wind and rains keep on giving me the cold sensation on my face and my legs. I could not understand why it was too refreshing to run in this kind of condition. So, for the duration of 80% of my run, it was raining hard and I enjoyed every minute of it! But at daybreak, I need to attend to my “morning call of nature”. Well, it was a nice experience bringing back those old days when I was a young officer patrolling in the mountains and forests where you can do anything to relieve yourself under a tree, a rock, and over a flowing stream of water. But this time, I was surrounded with plants on the shoulder of the highway with strong rains falling over me! I am sure those guava plants that surrounded me will bear a lot of fruits in the years to come! Finally, before 6:00 AM, I could see the buildings and structures of Alaminos, Pangasinan at a distance. More push and jog brought me to run along the Diversion Road until I reached the end of the road that connects to the Alaminos-Sual Highway. My Garmin watch registered a distance of 60.5 Kilometers and was able to cover it in 9:00+ hours. Another Adventure Run done! I hope those runners who are inspired to experience this kind of activity will have a chance to see the scenery of the West Coast of Luzon from the Subic Freeport to Alaminos, Pangasinan. In due time, the West Coast 200 as a Multi-Day Stage Run will be presented as one of the PAU/Bald Runner’s Events for this year. As per initial planning, this running event will be “By Invitation Only” with 50 Slots Available on a “First Come, First Serve” basis. Details will be announced on FACEBOOK and on this blogsite soon! Your the best sir Jovie like one of my super idol “Navy SEALs David Goggins..hooyah!! !God bless sir..